What will the Aiur Knowledge Validation Engine do in practice? Validation of the document’s building blocks. Understanding the core essence of an input research document is a prerequisite. Hence, the project’s initial MVP will identify the main topic and sub-topics discussed in a given input document. Building from there, Milestone 1 will focus on extracting the main structural elements contained therein: i.e. Problem, Solution, Evaluation and Result descriptions. Milestone 2 will then use this extracted information to build knowledge graphs. Lastly, Milestone 3 will incorporate information from images, tables, graphs, etc. (i.e. ‘black data’) into these graphs. In a nutshell, our development roadmap points to the creation of causal connections between scientific articles, finding similarities on a lower structural level (i.e. like common solution, evaluation method or results obtained). The aim is to build software that can extract a pseudo hypothesis or argument (e.g. a Problem — Solution — Evaluation — Result sequence) from any given scientific text inputted. This output will then be used for developing more advanced science assistance functionalities, such as summarization of information, recommending similar articles, identification of building blocks, or finding true references, among others. 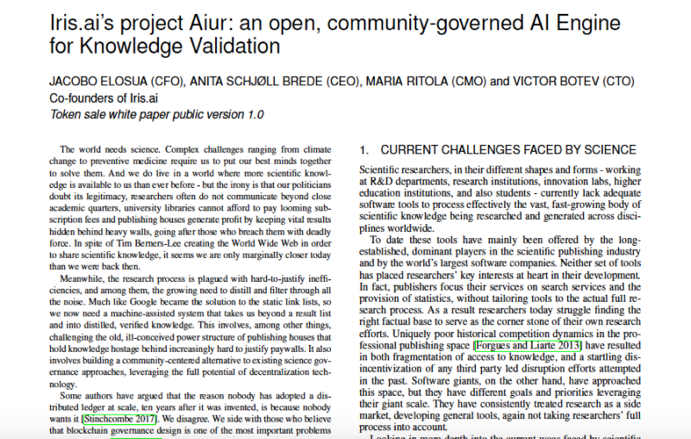 As relayed in project Aiur’s white paper, the ultimate goal of the Knowledge Validation Engine is, err, validating knowledge! In practice, this means that a user should be able to recruit the Knowledge Validation Engine’s help automating certain tasks in the process of approaching a given research challenge. Answering, for example, to what extent are the assertions made in a paper backed up by previous research? What is the quality of that supporting evidence? Is it conflicting? Are there boundary conditions identified in the literature not being taken into account? These are just a few of the questions that the Knowledge Validation Engine should help address, to authors, reviewers or implementers alike. With one final question asked at the end of the journey: can this paper be preproducedand, in that case, reproduced? A Knowledge Validation Engine should thus significantly improve scientific publishing, peer review and industrial innovation alike. This intelligent machine should help bring about new standards in transparency and accountability, laying a solid foundation to address some of the critical shortcomings of the inefficient, traditional processes plaguing science today. With an open-for-scrutiny, decentralized, community-owned Knowledge Validation Engine scientists, acting in their different roles, would face a whole new set of incentives better aligned with bringing about disintermediation, raising quality standards and the collective advancement of scientific knowledge. In fact, as members of arguably the world’s most exciting community –at least from a future impact viewpoint!–, the engine’s users could go a long way in addressing some of the most often cited issues they face, namely: (1) information overload; (2) access barriers; (3) reproducibility issues; (4) built-in biases; and, (5) incentive misalignment. As pointed out by Lambert Heller, blockchain technology holds great potential in bringing us closer to forging a technology friendly, new generation scholarly commons. In the path towards achieving that vision, it is our firm belief that the world’s broad science ecosystem would benefit immensely from a functioning, community-owned Knowledge Validation Engine like Aiur. We sincerely hope you consider joining us in this attempt to conceptualize, design and execute it in a truly joint effort. For more details, please check the white paper and related project information available at https://projectaiur.com. How Iris.ai and Project Aiur relate	The token pre-sale of Project Aiur is here!